Low Level Laser Therapy, or sometimes referred to as Cold Laser, is an excellent treatment that is often utilized to treat a wide array of conditions and pain. This therapy allows the body to naturally heal itself by stimulating the mitochondria of the cells with laser light at very specific wavelengths. This low level laser therapy consists of a light-emitting diodes that can be utilized on many different parts of the body. It’s called Cold Laser because this type of therapy doesn’t heat tissue. It uses a low level laser combining a synchronous frequency of red LED light, infrared light, and infrared laser which passes through a static magnetic field. It is this specialised combination of light energy which optimises the healing response. Cold Laser or Low Level Laser Therapy, improves the signalling within a cell. Cells are filled with ‘organ like’ specialised structures called organelles. One of these organelles called ‘mitochondria’ (which is in charge of a cells energy production) is believed to play a key roll in the healing response of cold laser. Mitochondria are believed to have photo receptors (light receptors) which respond to light energy (photonic energy). Cold Laser Therapy improves cell communication between its membrane, nucleus and the mitochondria, which ultimately results in the mitochondria being able to produce more energy (Adenosine triphosphate or ATP), leading to better cell function, pain relief and healing. It has also been reported that Cold Laser Therapy may also reduce pain by increasing the production of our feel-good chemicals called ‘endogenous opioids’ which occur naturally in the body, and reducing tissue swelling by stimulating the lymphatic system, as well as having anti-inflammatory effects. 59% improvement in the group that received the combined treatment of Chiropractic and Cold Laser Therapy. That’s DOUBLE the results for this group receiving treatment in the same time frame! This research demonstrates our clinical belief that Cold Laser Therapy works beautifully with Chiropractic care. The goal of Chiropractic is to help a person function better by removing the accumulation of lifestyle stress around the spine and body, which can disturb the nervous system. How long does a Cold Laser treatment take? Generally 3-7 minutes, depending on what areas of the body need attention. Although many patients notice immediate results, the general guideline is to divide your age by 10 and that would be the number of treatments it would take to notice significant improvement. Based on your condition the doctor will recommend the appropriate numbers of treatments needed to resolve your problem. Chiropractic manipulative therapy and low-level laser therapy in the management of cervical facet dysfunction: a randomized controlled study. J Manipulative Physiological Therapeutics. 2011 Mar-Apr;34(3):153-63. 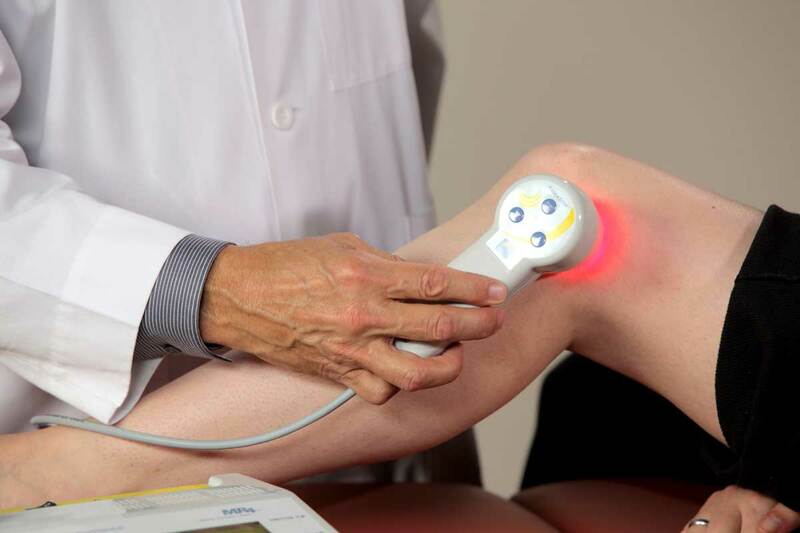 Low Level Laser Therapy for painful joints; review article. Journal of Lasers in Medical Sciences; SPRING 2013; 4(2); 67-69. Any damage done to the body that needs to be healed, will heal in 1/3 the time it normally would take without low level laser therapy. It is truly AMAZING!!! Ask Us Today About Utilizing Low Level Laser Therapy Treatment in your road to health!